The Super Bowl, to me, is as good as the company and the snacks. The half-time show comes next, then the entertaining commercials, annnnnd then the actual game. Please, don’t tell me you’re surprised. I’ve never been a fan of football, really, and I don’t see that changing anytime soon. My guess is that, when I’m capable of hosting my own Super Bowl party (which I someday will, despite being totally removed from football culture), guests will just know I’ll be in the kitchen. Sure, I’ll make my way out to socialize, watch a few commercials and of course the half-time show, and assess the liking of the food. But for the majority of the time, if you need me, come to the kitchen and if I need you, I’ll get you an apron. Last year, around this time, I was buried deeper than ever before in school work (basically taking 7 classes and volunteering and working part-time), and we won’t talk about that too much, but the constant - literally c o n s t a n t - presence in my mind of genetics + foodservice management + anatomy + metabolism drove me almost insane. And I say “almost” because I discovered the Bon Appetit Foodcast in the midst of all that rigid science and I firmly believe it saved my life. In the span of three months that was the most challenging quarter of all of college, I think I listened and re-listened to 80% of the episodes. Much of that time was also spent multitasking walking to and from campus, just so you know that I wasn’t a totally sad, isolated human being. One of the first episodes I listened to was allllll about the Super Bowl. Carla Lalli Music, Adam Rapoport, and Gabe (sorry, Gabe, I don’t know and can’t find your last name on the internet, but you’re awesome!) discussed, argued about, and described the intricacies and traditions behind their favorite Super Bowl-themed recipes. From chicken wings to beers, from gumbo to bahn mi sandwiches, these three opened my eyes to a whole new feeling of enjoyment around food. It felt fun and I desperately needed fun with all the dry talk of iron absorption and elementary school lunch programs and bones in the upper thigh and alleles. It felt approachable and I loved that because only a few months before, I decided to focus the blog on sweets only after feeling sooooo not talented in the savory realm of food. Finally, I felt inspired. I didn’t just feel it, actually. It rolled out of me in the most genuine form of laughter, even when listening to three food experts I’ve never even met. It shot through my veins, keeping me going during my 10-hour days on campus. It gave a new edge to my passion. Bon Appetit, Carla, Adam, Gabe - if you’re reading this, please know that your podcast has changed my life and I’m probably not the only person to feel that way. There was an undefinable set of standards I was trying to meet for each savory recipe I came up with, and finally, I was able to cook without that pressure. Cooking should feel approachable, exciting, and inspiring for our individually creative brains. This year, I challenged myself to come up with something Super-Bowl-themed to highlight Brazi Bites - an unbelievable, authentic Brazilian cheese bread - and felt so stumped until I released myself and my creativity from some made-up set of standards even I couldn’t describe. And I chose Brazi Bites because they, too, cook from their culturally inspired, individual creativity. They are approachable, yet tasteful. They are exciting, inspiring, and absolutely delicious. I don’t know what my plans are for the Super Bowl this year, but I know I want to encourage others to cook without standards. I want to share authenticity rooted in tradition, and also beaming with creativity, the way Brazi Bites do. Begin by cooking the veggies. Heat a large (10-12”) cast-iron skillet over medium heat, add the 2 tbsp. oil, swirl, and let this heat up for about a minute. Sprinkle in the chili powder and spices to the oil - this is called blooming and it enhances the spice flavor. Then toss in the chopped onion, cover, and cook until translucent and lightly charred, about 8 minutes. Add the minced garlic and chopped zucchini. Cover and cook for another 5 minutes, or until the zucchini has softened and lightly charred. Add the kale, cover and turn the heat to low, and cook until it turns a vibrant green color. Season with sea salt and pepper. Now, pour in the crushed tomatoes and beans and stir to combine. Reduce the heat to the lowest setting and let the chili cook for about 8-10 more minutes, stirring every 2 minutes or so. 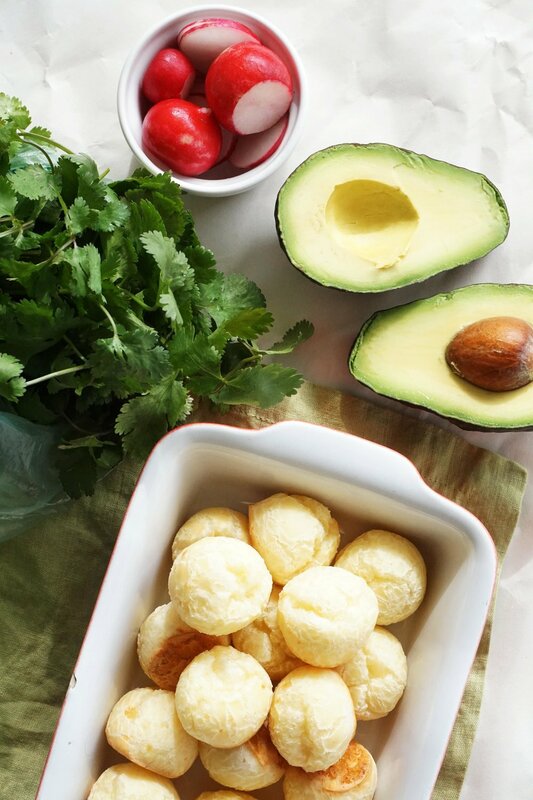 Place the frozen Cheddar-Parmesan Brazi Bites on the baking sheet, leaving about an inch between each bite. Bake these according to package directions - 18-20 minutes at 400F. Assemble the chili bowls when the Brazi Bites have about 5 minutes left. Scoop the chili into bowls and top with shredded cheddar, avocado, fresh cilantro, and sliced radish. 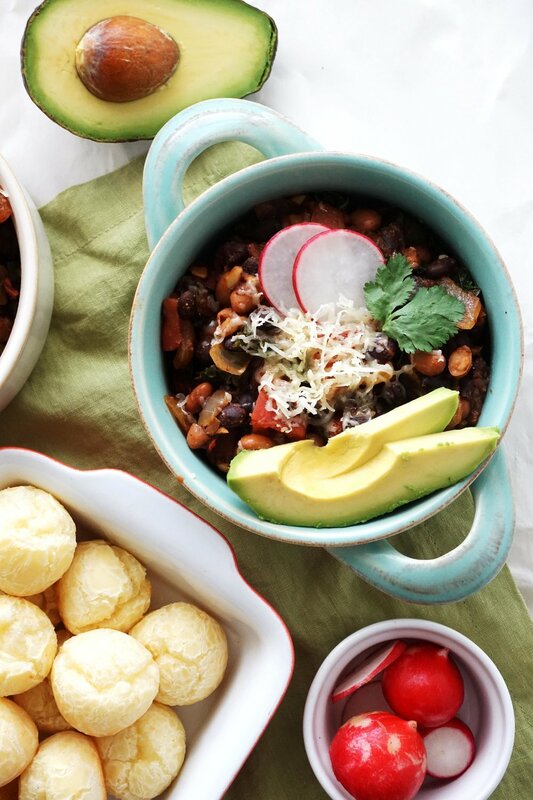 Remove the Brazi Bites from the oven and serve alongside the warm chili. They’re perfect for dipping or just enjoying as a complement. Store leftovers in an airtight container in the fridge for up to one week or in the freezer for one month. This post is sponsored by Brazi Bites - all opinions and statements are my own. Thanks for supporting my blog and passion for cooking!